Whether you’re hosting your son or daughter’s birthday and looking for kids’ party food ideas or you just want a fun food addition to perk up family meals, you’ll find ideas to match themes and satisfy appetites right here. Click on the post and you will find that directions and recipes are included for most — and you’ll discover easy steps to ramp up the “wow” factor for extra delight! Check out these 7 Sweet Popcorn Recipes for a sweet and salty treat kids will love. Serve these Rice Krispie Treat S’mores for a great twist on a classic treat. Start the birthday with a special breakfast or just add a little monkey business to any kids’ breakfast buffet. This treat has been popular for years; now you’ll know the easy way to make them! They’re a perfect option on a party dessert table or make them for take-home favors. Strawberry mice sure look nice…and they disappear about as quickly as the real thing! This kids’ party food is not only a healthy option—it’s a darling (temporary!) decoration on a buffet table as well. Popcorn shows up at a lot of parties; give a sweet twist to this kids’ party food favorite snack with some tasty additions. Dress up your buffet with olives in disguise as tuxedo wearing penguins. Just three ingredients and you’ve got a flock ready to party for a fun or dressed up theme! Donuts are a good idea anytime, but they look especially festive on a dessert table when they’re wearing colored sprinkles for decorations! Yes, we have s’more dessert table ideas! Yes, you can serve them even if your party isn’t campfire themed! These are quick and easy and you don’t have to leave the house to make them. My boy, Sam, loves to bake—and eat—these! They’re very versatile; they can stand in for cupcakes on a dessert table and they work with a variety of theme ideas. You can hardly have a boy’s birthday party without including some form of popcorn on the dessert table! Discover ten awesome temptations, including chocolate, caramel and rainbow popcorn. A party dessert table featuring plates piled high with cookies is an invitation for boys to come closer…and smile bigger! With a dozen recipes, you’re sure to find favor with all your guests. There are several ideas for cotton candy flavors—including cherry garcia, turtle frappe and raspberry mocha—and each one would be perfect for a carnival or circus theme party…or just a party for your mouth. What’s a party without something special to drink? Add some sparkle with glow-in-the-dark drinks, color changing beverages, swamp juice and seven more delightful ideas that can work for any birthday theme. pleasing idea. These are easily made with kitchen supplies you probably already have. There is nothing boring about sandwiches on the party menu when they’re as delicious as these! When you want to serve more than just birthday cake but don’t want a formal meal, these sandwiches will fill the bill. If you’re concerned about too many cupcakes and sweets on the dessert table, add some fruit. Apple Turtles won’t be slow to disappear. Whether you use this tasty fruit as a dessert table decoration or a hands-on activity, orange monsters should definitely be invited to your next party! Colorful carrots star in this easy-to-eat appetizer for an Easter themed party or any time you want the kids to eat more vegetables! Yummy bread, cinnamon sweet and quick to make plus the bunny shape counts as a decoration on an Easter buffet or woodland themed party table. Egg-shaped, Rice Krispie treats with colorful sprinkles are a mouthful of fun at a child’s Easter party. Bananas, strawberries and just a bit of cookie stack up to a colorful dessert table option that kids love. You don’t have to wait for a Dr. Seuss themed party to enjoy these colorful frozen confections—they make a terrific, easy-to-hold party food. Here’s a witty way to serve eggs for a child’s wake-up birthday breakfast. Add ham and Dr. Seuss might show up. A little salty, a little sweet, a bite-sized morsel kids will want to eat! These little babies are a fun idea for adding color to a kids’ dessert table. Super-easy and super-fun, noodles can become any color of the rainbow—a great idea for a kids’ party food anytime. Seeing these Mike Wazowski inspired green treats on a dessert table is an invitation for fun! If you’ve ever made rice crispie treats before, you know how easy they are to make and shape. They’re perfect for a Monster University Party. We can’t leave Sully off the dessert table! These are basically blue colored popcorn balls—easy to make with supplies you probably already have. Although candy apples are often associated with the fall season or with circus/carnival themes, they are a delight to bite any time! Include them at your next party dessert table and watch ‘em disappear. With so much candy at Halloween parties, wouldn’t you like a healthier themed option for your dessert table? How ‘bout SIX?! Mummy toast, spiders on a log, banana ghosts, clementine pumpkins, olive spider cheese balls and butterspider pudding …BOO! Eewww! I know they sound gross but they are PERFECT for a Mad Science themed party or a Halloween dessert table. Boys love the idea! These little delights are awesome for a fire truck theme party! They do double-duty as a decoration on a dessert table and you might even want to use them as take-home favors. Having a superhero themed birthday party? These cake pops and cookies add a decorative punch to the dessert table plus make all the boys super happy! Fingerprints, foot prints and crime scene cookies add a lot of wow to a police themed dessert table. This is another birthday party favor idea, too. For a police themed birthday party, a dessert table ought to have cop corn (popcorn) and heist cakes (rice cakes). Man cannot live on birthday cake alone. A carved watermelon robot would be perfect for a themed birthday party or even a fun summer dessert table. Copy the picture exactly or use it to jump-start your own imaginative ideas. 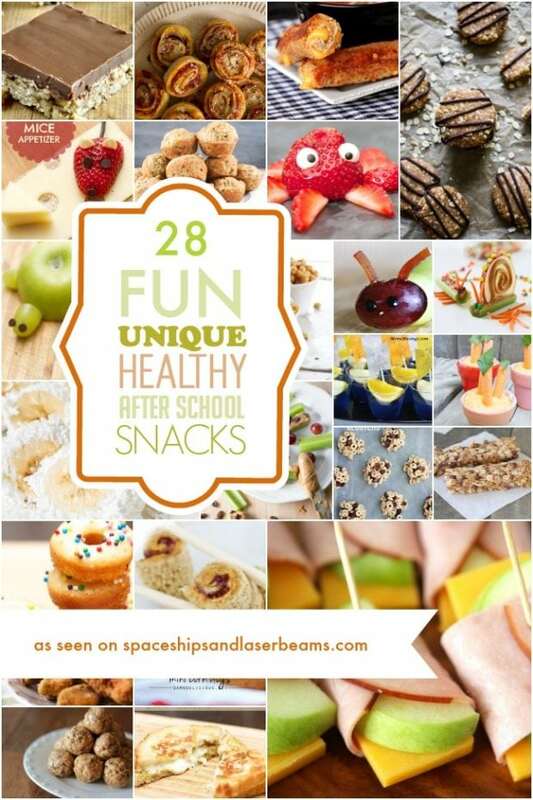 Get ready for any birthday party — or make an average day special — with these kid’s party food supplies sourced by the Spaceships and Laser Beams team. Check out more great party food ideas kids will love.